Succulent Liners and Pots have become very popular in the marketplace in the last few years. Home gardeners and professionals alike are attracted to these easy-to-grow plants because of their durability and year-round beauty. A well-placed combination of succulents tend to give immediate appealing results. 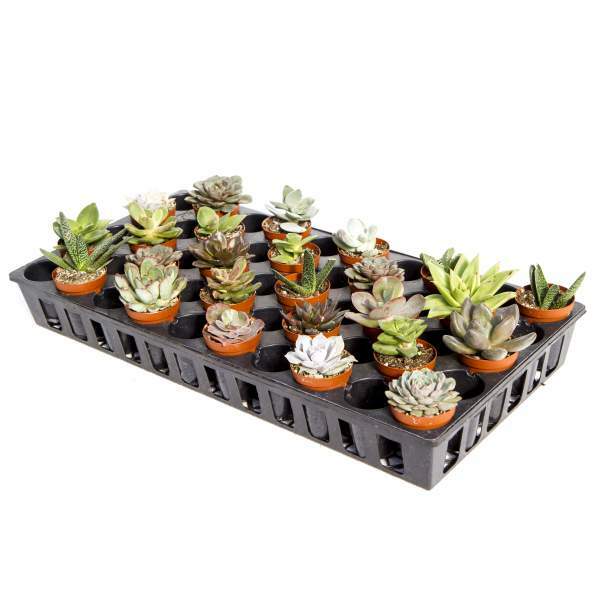 Our high-quality 50-cell plug trays come with 25 high-quality 2" pots. These retail-ready succulents are hand selected to produce a quick turnaround for you in your garden center or greenhouse. Grow succulents pots on the dry side in a very well-drained soil. They store water in their leaves and do not need to be watered as often as other plants. We recommend using a water soluble feed every two weeks at 150 ppm N. Do not allow the plant to stay saturated or you will develop root and stem rot. Maintain a pH between 5.8-6.2. Succulents do not require pinching. Space your succulents as needed based on their size. They can be grown in spaced pots for retail or used in combination with other plants in combination planters. Plant growth regulators are not necessary. Succulents have no real pest problems. Succulents are not prone to many diseases, but don't oversaturate the soil. If the plant sits in moist soil for an extended amount of time, you could end up with root rot, stem rot or botrytis. Botrytis grey rot is usually associated with wet or humid conditions. You can prevent botrytis by allowing the plant to dry out between waterings, allowing for good airflow in your greenhouse, and spacing to allow the sun to penetrate to the soil level. The most common chemicals used to treat botrytis and root rot are Medallion and Banrot. Use them as a drench according to each label's instructions. We recommend planting 1 starter plant per pot for retail sales. You can also space them in a combination planter to make a product that ready for immediate sales.